In most cases, when a church needs a lawyer, it hires a lawyer. When it needs a plumber, it hires a plumber. But when it comes to making business decisions, most churches convene well-meaning but often inexperienced volunteers to form a committee, then they take a month and vote on the color to paint a door in the nursery. Conducting business this way kills the vision and drains the passion out of right-brained, creative, relational pastors and ministry leaders. The modern church is being poorly managed and does not know it. The level of inefficiency and waste in today’s churches is staggering. 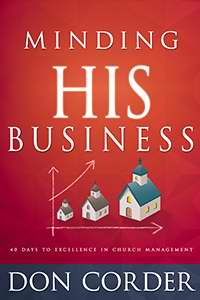 The church is not a business but it conducts business, and in most cases, the people conducting church business are not trained and/or experienced in business. This book was written to convey basic business wisdom, management principles, and best practices to right-brained, creative, relational people (i.e. pastors). Unlike intimidating business textbooks, it is written in forty short vignettes designed to be read like a daily devotional. Each chapter deals with everyday challenges and offers real-life examples derived from more than thirty years of experience that show how to (and sometimes how not to) handle each situation. We had a fundraiser at our house last night. About 20 attended. Inflation is eating away in Malawi, Africa. When I first went there the US $ would buy KW160.00. Now it is US $ 1.00 = KW 475.00.